basketball was my sport. I don’t know what it was, but after Jordan, Magic and Larry and their supporting casts went away, it sometimes seemed like the NBA turned into the athletic version of the Kardashians. LeBron is still hated for leaving Cleveland. Truth is, if the NBA game has changed a lot in recent years, so have games in general. It’s about the money, the mansions, the bling and the babes, no matter what you say. Shame has lost its identity in our world—no publicity is the only shameful state. Tradition, love of the game, team: why do they sound “quaint”? If you want an indicator, consider that staying for your junior year in college is considered “noble”. Since when did education become a liability and being rich a necessity? Maybe that’s why “March madness,” the NCAA’s annual “survival of the fittest” is so much more attractive to me than the NBA. 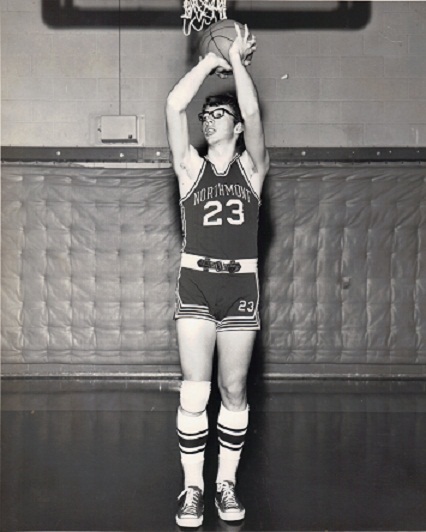 I was a high school basketball player. I wasn’t great, just okay. Co-captain of my high school team as a senior and all that. But years after I graduated, I kept playing—intermural in college, even playing with the high school kids as a pastor until my joints wore out. All because there was something FUN about the physical test of shooting, dribbling, passing, playing. Most of all, trying to win together. I like Jeremy Lin. Nothing to do with being “Asian” (why do we always go there? ), Harvard-educated (okay, he can get a job when he retires), third-string sub who makes good, but just because he reminds me of a time in my life when I’d rather shoot hoops in forty degree weather than play guitar—and that was saying something. There are still plenty of great NBA players and people who are about winning. Shaq, Tim Duncan, last year’s Mavs and the largely unheralded bench guys who lay it on the line. But fame and fortune have crowded “team” into a tie for third at best. Watching an NBA game just ain’t Lakers-Celtics in the 80s. Where are you, Bill Russell, Magic, Larry? And maybe today’s games just reflect us in general. So I like Jeremy Lin. Nothing to do with Asia, Harvard or world peace. Linsation is just about doing your best. Call it excelLINce—character, quality, and love of the game. He’s an amateur (from the Latin word for “love,” thus one who does something purely for the love of it) in a game long ruined by money. Ultimately, if the human soul is to survive, there has to be something in us that we do for the sheer pleasure and value of doing it and the joy of watching. Hey, kid, pick yourself up. You’re gonna lose now and then. Get ‘em tomorrow. Posted on February 18, 2012, in Basketball, Competition, Culture, Ethics, Sports, Sports and tagged amateur, competition, Harvard, Jeremy Lin, Larry Bird, LeBron James; Shaq, Magic Johnson, March Madness, NBA. Bookmark the permalink. 4 Comments. Even if the run is over, it was a great run! Played hoops in college. First point guard on University of Montevallo’s first women’s team. My mom was recently lamenting about the things she could no longer do. I told her the thing I missed most was running up and down the court shooting hoops. Sheer joy in that gym, win or lose. You are correct linsanity will fade. However, that wee part of American’s heart that somehow always pulls us together to cheer on the underdog will just lie in wait for the next Jeremy Lin. In a time of stark division we need Jeremy Lin to remind us all we are still one. I kind of still like the OLD unis. No pants on the ground. What a great memory. You were part of something very special. Thanks for sharing. Running hard and getting stronger for it–we didn’t know how great that was!